You might have heard about so many people escaping from the prison but have you ever heard about a cat escaping from the cage ? I understand that it seems impossible that how can a cat break the cage, but it is true. You will believe me after watching this video featuring a cat king opening the cage window by himself and coming out from behind the cage bars. In the beginning you see a white cat locked inside a cage. He uses his paws to open the door of the cage. Very intelligently he uses both of his front claws. It takes some time for him to grip the window locker. With little more effort he slides the window locker back and opens it. As he is an animal so he is not sure about whether the door has been opened even after unlocking it by himself. Then after some time cat comes to understand that the door has been unlocked and he comes out of the cage. Just to prove that it was not a coincidence that a cat can escape, the cat is again put in the cage. This time again the cat opens the door little easy than last time and comes out of the cage. This time immediately he understands that the door has been unlocked and comes out without any delay. This cat is really amazing and i have never seen this kind of amazing and intelligent cat. As cats have flexible bodies and sharp retractable claws so it becomes very easy for them to grip anything like in this video we have seen cat gripping the window locker to slide it. Cats are more active than any other animal and they are intelligent too.. 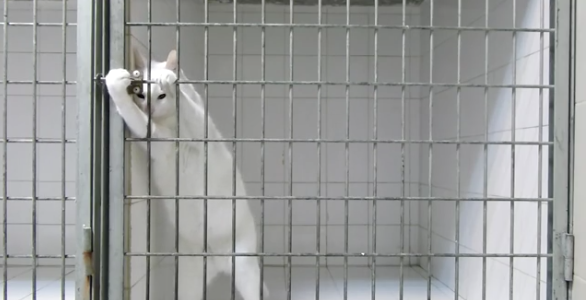 Thanks for watching this amazing video of a smart cat escaping from the cage and i hope you liked it.